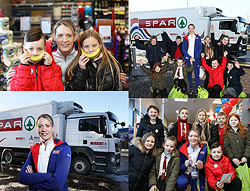 SPAR Scotland welcomed Scottish athlete Eilidh Doyle to its SPAR store on Pittsburgh Road, Halbeath, Dunfermline on Wednesday 30th January. Eilidh Doyle, originally from Perth, is a British track and field athlete who specialises in the 400 metres hurdles and the 4 x 400 metres relay. She represented Great Britain at the 2012 Olympic Games in London, and won an Olympic bronze medal in the 4 x 400 metres relay at the 2016 Games in Rio de Janeiro. CJ Lang and Son Limited Marketing Manager Paula Middleton said: “We were so happy to have Eilidh visit our SPAR store and support our promotion of the 2019 European Athletics Indoor Championships taking place from 1st – 3rd March in Glasgow. “Eilidh was a pleasure to have in the store. She met so many customers and school children and was happy to have photographs taken and sign autographs. It was also so exciting for everyone to see her medals – in particular her Olympic bronze medal! “We are proud to be principal sponsor of the European Athletics Indoor Championship and Eilidh is a brilliant ambassador for athletics,” she added. Healthy Living Scotland also visited the store providing a stand and point of sale. A fruit tasting session and a treasure hunt took place around the store with children from the local Carnegie Primary School along with Eilidh Doyle taking part! The Healthy Living Programme is a fully funded Scottish Government programme whose aim is to improve the accessibility and sales of affordable healthy options within the convenience retail sector. It also links convenience stores with local schools and communities and educating the children on making healthier choices. Kathryn Neil, Programme Director of the SGF Healthy Living Programme said: “It was great to be able to be part of this fantastic event with SPAR and seeing how they are delivering responsible community retailing in their stores. “Working with SPAR and Eilidh to highlight the benefits of choosing healthy products will go a long way to encouraging all the children involved to love life and eat well. SPAR is principal sponsor of European Athletics and has been since 1996 and the 2019 European Athletics Indoor Championships will take place from 1st – 3rd March at Glasgow’s Emirates Arena. Other marketing activities taking place in SPAR stores across Scotland in the lead up to the Glasgow games include fleet branding, in-store POS, leaflets, social media and a five day SPAR tour by Scottee the mascot.